The Syrian Revolutionary Youth symbol graffitied on a Damascene wall.It has been over a year and a half since the last organized anti-regime protest in Damascus. The protest, which you can watch through this link, was held on June 12, 2013 in the Damascene neighbourhood of Rukneddine in solidarity with besieged Homs. It featured wedding-style revolutionary chants and singing. It was a typically brave evening protest by the Syrian Revolutionary Youth, a self-avowed leftist and civic collective, despite heavy security presence and tight regime control of the area. 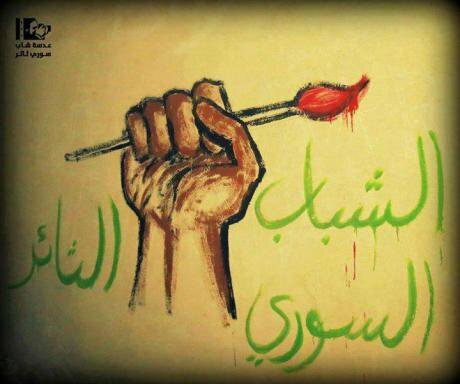 From the beginning of the Syrian revolution and well into 2013, the Syrian Revolutionary Youth injected a breath of fresh air into the lungs of an uprising that was being increasingly suffocated by the Syrian regime and counter-revolutionary forces. Established by a group of activists from Rukneddine, the collective embodied a clear political vision that was not restricted to vague demands for a democratic, civil state. At a time when such ambiguous yet sweeping calls were being made by liberal and moderate Islamist opposition groups, the Syrian Revolutionary Youth advanced a more clear-cut vision of social justice where free education, free health care, gender equality, the liberation of the occupied Golan Heights, and liberation of Palestine, were central to their demands. This was apparent from the first chants and banners raised during the collective’s protests in the Syrian capital. The Palestinian flag was lifted alongside the Syrian revolutionary flag; chants in solidarity with Palestine, and Gaza in particular, were chanted alongside slogans in solidarity with besieged and rebellious Syrian towns and cities; the names of Palestinian martyrs were mentioned in protests alongside the names of Syrian martyrs; young women and men protested and sang side-by-side; and calls for bread, gasoline and a dignified life for all were inseparable from their calls for the downfall of the regime, and the achievement of civil liberties and political freedom. As the uprising went through its gradual transition towards militarization, the Syrian Revolutionary Youth attempted to sustain the peaceful side of the uprising, maintaining that peaceful activism and armed struggle can go hand in hand. While generally supporting the Free Syrian Army, they frequently held banners criticizing what they considered violations by the armed opposition groups and insisted on defending national unity and rejecting sectarianism. The Syrian Revolutionary Youth’s mobilisations were not limited to organising protests in their native Rukneddine and a few other Damascene districts. They also distributed revolutionary pamphlets across Damascus, scrawled anti-regime graffiti on the city’s walls, used their Facebook page to publish statements and communiqués regarding important political events, and uploaded videos of their actions on their YouTube channel. The principled, unassuming stance of the Syrian Revolutionary Youth made it a target of the most extreme regime persecution. Most of the collective’s founding members have been arrested, killed, or forced out of Syria. In watching videos of their protests in 2012, the year in which their revolutionary activism reached its peak, it is hard to recognise the voice of a protester who wasn’t imprisoned, killed or displaced. As they struggled to keep active, the Syrian Revolutionary Youth remained one of very few unarmed civil groups who resisted being hijacked or domesticated by the NGO mentality or politicized funding. Their main source of funding remained the donations of the group’s members and they refused to compromise their vision to earn more financial support or television time. While videos of demonstrations with explicit sectarian slogans or pleas for foreign intervention were broadcast on corporate Gulf-based media, the protests and actions of the Syrian Revolutionary Youth, vehemently anti-sectarian, pluralist and opposed to foreign intervention, were published only on the group’s YouTube channel, despite the fact that their actions were held in the heart of the Syrian capital. Perhaps one of the shortcomings that would prove fatal to the collective, however, was that it remained largely confined to Rukneddine. Although the connections with activists in Homs led to the creation of a smaller Syrian Revolutionary Youth chapter there, the group’s main centre of activity remained the neighbourhood of Rukneddine. As important as it was to ensure a foothold in their local community, the inability of the Syrian Revolutionary Youth to achieve a similar feat in other areas meant that its impact and outreach remained extremely limited. It was also extremely reliant on its founding members, which meant that by the time most of the founding members were arrested, killed, or forced out of the country, the group’s on the ground activism had all but evaporated. Even their Facebook page has barely seen activity in recent months. However, for a group whose main strength was their movement on the ground, virtual activism had never been their central focus. The group’s inexperience, and at times lack of organisation, exposed members to even greater danger and made them incredibly vulnerable to being easily rounded up by security forces. In a country like Syria with a strong repressive security apparatus, recklessness and the smallest mistakes can be extremely costly, and in the case of the Syrian Revolutionary Youth, the price they paid came in the form of some of Syria’s bravest and brightest lives. Now almost fully dissolved as a collective, members of the Syrian Revolutionary Youth continue to languish in Syrian regime jails. This December 30 marks one year since the arrest of seven of the collective's activists from a Rukneddine home by Syrian security forces. Their arrest remained largely unpublished with the families of the detainees demanding anonymity out of fear for their children’s well-being. Anonymity did not help. All but one of the seven detainees taken during that night raid have been reportedly killed under torture as confirmed by their cellmates. Photo of the martyr Amer Zaza. 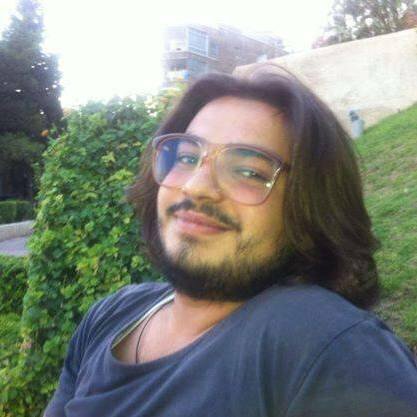 On 1 December, Syrian activists circulated on social media news of Amer Zaza’s death by torture. Zaza had been arrested a year before together with six other friends from their Rukneddine home. Roudin Ajek, another of the Rukneddine Seven, a talented basketball player and the captain of his youth team, was killed under torture in May 2014. Both Amer and Roudin had briefly left Syria in mid-2013 for Egypt, but their commitment to the revolution and their love for their country pushed them to return. Fayez al-Ayoubi, along with brothers Muaz and Qusai Burhan, were also among the Rukneddine detainees killed under torture. On 14 December, we received news of the death under torture of another Syrian Revolutionary Youth activist and founding member, whose name shall remain anonymous at the request of his brother. Just like Roudin and Amer, the latest martyr briefly left Syria in May 2013 before returning. Much of the information, in fact, in this article about the collective was through an interview I conducted with him through Facebook in June 2013. He was sharp, eloquent and extremely committed to both the Syrian revolution and the Palestinian cause. During his first arrest in November 2012, this 26-year-old Damascene survived 37 days in solitary confinement and held firm despite suffering torture. It only adds to the cruellty of his killing that he cannot be publicaly eulogized and given the tribute he deserves as a revolutionary and courageous leftist. Remembering the Syrian Revolutionary Youth and mentioning its fallen members is not a mere act of nostalgia to the revolution that once was, or to the Syria that might have been; it is above all a tribute to students, neighbourhood kids, and previously apolitical youth in their early and mid twenties who have paid the price for dreaming big and peacefully fighting to reclaim their city from the dictator and his shoe-lickers. They paid a further price for offering a third alternative beyond the regime/Islamists binary and for refusing to sell out or adopt the agenda that would please the outside opposition. As the shadow of death under torture hangs over the entire group, it is difficult to end the story of the Syrian Revolutionary Youth on an optimistic note. It is also a tragedy that one of the most inspiring and promising grassroots groups to emerge out of the uprising has been stifled. But it is safe to say that their legacy will live on and that they will never be forgotten, and neither will the ideals that they fought for and sacrificed so much for at such a young age.